When I was a kid, I remember seeing my dad do a headstand and thinking it looked like a lot of fun. So naturally, I wanted to try, too, and I discovered that I loved the sensation of being upside down. Of course, I didn't know I was "exercising"—if I had, that might have made it less fun. Years later I encountered the headstand again in a yoga class, and I was surprised by how much harder it had become now that I was a full-sized adult. Nonetheless, I embraced the challenge and found that I still liked it enough to want to get better at it. As my training progressed, I came to learn about lots of other ways of turning myself upside down. I also found out that inversions have a slew of benefits that I hadn't even considered. There's a lot to gain from practicing these exercises besides just showing off in front of your friends: Inversions are great for building body awareness, balance, and core strength. In fact, newcomers are often surprised how much core engagement these exercises require. Plus, any time you temporarily reverse your blood flow by turning upside down, it gives an invigorating boost in circulation for the rest of the body. Still, in addition to the physical challenge, inversions can often be psychologically overwhelming for beginners. It's scary to turn yourself upside down at first! Tackling this fear can be very empowering, however. To get the most out of your shoulder stand, think of lengthening your entire body while tightening your abs and extending your legs. You may feel a deep stretch on the back of your neck, but don't push it if you feel pain. 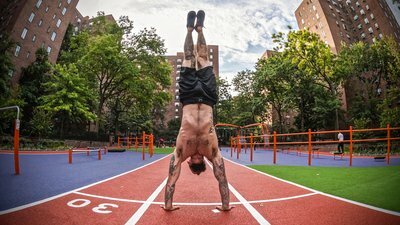 You may not be able to achieve a perfectly straight shoulder stand at first, but with practice, it should eventually become a relatively easy move. Some people will find the forearm stand easier to hold with an arched spine. This is sometimes known as a "Scorpion Pose." If you are having difficulty balancing in a regular forearm stand and want to try the scorpion variation, be forewarned that it can be an intense back bend. It might be a good idea to warm up your spine with some preparatory bridge work. In a list of already esoteric exercises, this is the most unusual, and perhaps the most difficult. It's also a bit different because you will no longer be in contact with the ground, instead using your feet—yes, your feet—to support your body while inverted. No, you don't need one of those "inversion tables" to do this. You can do it on any pull-up bar or monkey bars, and you'll still get the circulatory benefits while working your quads, feet, and ankles in a way you never have before. Make sure you are actively maintaining tension throughout your body the entire time, especially in your abs. In fact, you may find it easier to hang in a partial sit-up position with your torso flexed forward at first. If you feel like you're starting to lose your footing, be ready to grab the side posts and lower yourself down carefully before you fall. However, I recommend making sure there is something soft beneath you, just in case you slip. Some people may experience lightheadedness at first when they are new to inversions, so remember to ease in slowly. As with any new exercise, you don't want to attempt too much, too soon. Also, be careful to avoid holding your breath when practicing any of the aforementioned exercises. There's a lot to think about when you are upside down, but breathing should still be near the top of the list! Want to turn the normal way of training upside down? Then try Total Fitness with Andy Speer, only in Bodybuilding.com All Access. Across nine weeks, you'll combine the best that body weight and bars have to offer to redefine your athletic potential!